US fighter planes fired warning flares after Russian jets entered an agreed non-conflict area over Syria, the US defence department says. The two Russian Su-25s flew east of the Euphrates River and into US-designated air space on Wednesday, the Pentagon said. 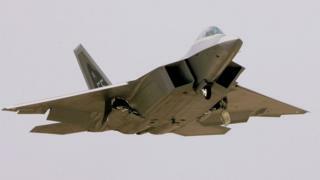 One of the US F-22 jets was nearly involved in a mid-air collision with a Russian plane, according to the US. However, the Russian defence ministry has denied the US account. In a statement it said the two Su-25s had been escorting a humanitarian convoy near a town beside the Euphrates when they were approached by the two F-22 jets. At the weekend Russian official Igor Konashenkov said he was bewildered the US had staked a claim over part of Syria's air space and accused the US-led coalition of "operating in Syria illegally". This is the most serious such incident involving Russian and US planes over Syria, BBC Defence Correspondent Jonathan Marcus says. According to the Pentagon, numerous calls were placed "on the emergency channel to convey to the Russian pilots that they needed to depart the area". A Pentagon spokesman said a verbal agreement was made between Washington and Moscow over the "deconfliction zone" in early November. Under the agreement, the US considers the area to the north and east of the Euphrates River part of their "skies", while Russia has freedom to patrol west of the river. But the US says Russian planes have flown into its zone six to eight times a day. "It's become increasingly tough for our pilots to discern whether Russian pilots' actions are deliberate or if these are just honest mistakes," the spokesman said. This is the most serious incident so far involving an encounter between US and Russian warplanes over Syria. It reflects the proximity of Russian-backed and US-backed forces in the Euphrates River valley, as the campaign against the remnants of so-called IS moves into a new phase. The battle now is about who controls territory on the ground, previously part of the IS "caliphate". Washington and Moscow have agreed that some 70km (43 miles) of the Euphrates River should be a de facto demarcation line between their air operations but, over recent weeks, Russian jets have frequently crossed into air space on the eastern side of the river. The firing of flares by the US aircraft in this latest episode is not an offensive action but one intended to underline their presence, after which it appears the Russian aircraft withdrew. But it is a worrying sign of the growing potential for accident or misunderstanding.